Art carefully created by Mario Aguilar. 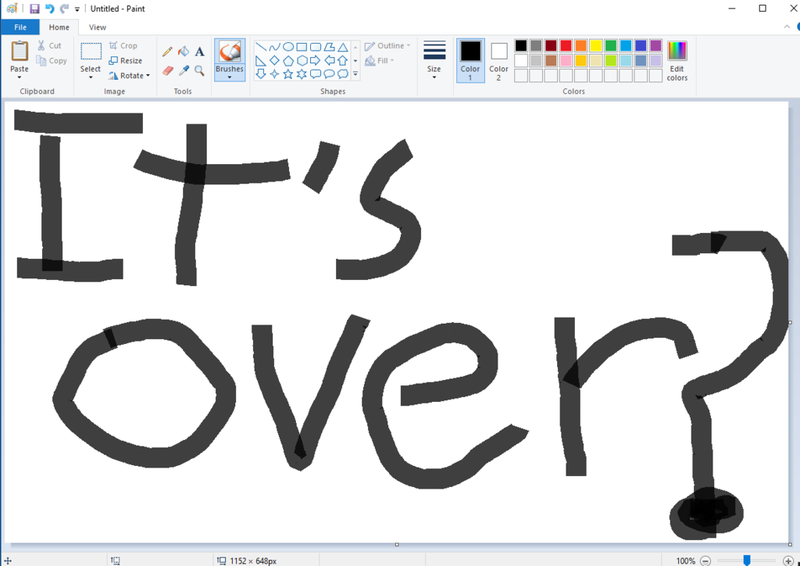 This morning, Windows users woke to terrible news: Microsoft was reportedly axing its beloved Microsoft Paint. The program, which has been annotating our memes, creating our webcomics, and teaching us how to art since 1985, is on Microsoft’s list of Windows features to be removed or deprecated in the Windows 10 Fall Creators Update. But this doesn’t mean Paint as we know it is dead! The list Paint was featured on very specifically says that each product will either be killed, or it will be deprecated—which merely means it will no longer be actively developed. Paint falls into the latter category. So it could be dropped in a future update, or it could hang around for the next decade—an artifact of a different time. Outlook Express, another Windows application that’s conjures memories for older users, is being killed in the same update. It is officially supplanted by the big boy Microsoft Outlook, which is more stylistically in line with Windows 10 than Outlook Express. While Outlook Express has long languished in the shadow of its hipper Outlook cousin, MS Paint has seen infrequent updates that at least allow it to look like it belongs on a 2017 computer instead of one from 1985. Microsoft is very aware of how much affection users have for Microsoft Paint. The product, which many of us used as a digital doodling book when we were kids, has a cult following. When Microsoft briefed press on the original Creators Update back in March, its representatives only had nice things to say about the application. Paint is on every Windows computer! It makes creating art easy! It’s like Photoshop but simple and free! This is not how you talk when you’re planning to ax a product. This is definitely the kind of talk you deliver when you’re launching a new Paint product. Which was what was happening at that press briefing. Microsoft launched Paint 3D, a 3D rendering and printing tool intended to simplify the production of 3D products, in March. The name Paint 3D was specifically used so play on people’s nostalgia for MS Paint. It’s not unreasonable to expect that the upcoming Fall Creators Update will see Paint 3D expanded to incorporate the features we all know and love from Paint. Either way, it is not in Microsoft’s best interest to kill an application that has been loved for more than 30 years by users. Right now Microsoft is campaigning to steal all the artists and other creators who have traditionally preferred the Mac ecosystem for creating digital art. It’s why Microsoft spent so much time talking about the Surface Pen when it updated the Surface Pro a few months ago, and it’s why it launched the Surface Studio last October. Heck, it’s why it keeps calling every new Windows OS update a “creators” update. It wants those users! Transforming its most enduring creative application into something more robust is a clear next step. Eventually Microsoft could kill the ugly version of Paint we love in order to release shiny new version of Paint or a Paint-adjacent application. Or Microsoft could just leave MS Paint in the Deprecated column for a while, a cool app eventually destined to be forgotten as younger computer users snap up alternate tools like Photoshop Express or Autodesk Sketchbook. Either way Microsoft Paint isn’t dead, it’s just deprecated, and Microsoft has made no comment on how long it could be deprecated. So maybe don’t go ordering funeral flowers just yet. We’ve reached out to Microsoft to learn more about the plans for Paint and will update if we hear back get back to us. MS Paint is not going away. In addition to the new 3D capabilities, many of the MS Paint features people know and love like photo editing and 2D creation are in Paint 3D - the new app for creativity, available for free with the Windows 10 Creators update. In the future, we will offer MS Paint in the Windows Store also for free and continue to provide new updates and experiences to Paint 3D so people have the best creative tools all in one place. So there you have it. MS Paint is safe....for now.